I rarely have time for anything more than a quick grab for breakfast so on the weekends I like to treat myself. 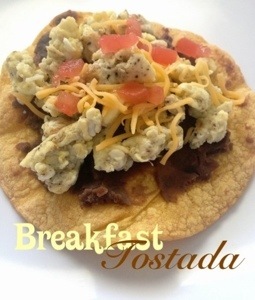 And this Breakfast Tostada was a little gift to myself this past weekend. This particular dish has been on my mind for a while now. It’s basically my favorite breakfast taco on a crispy corn tortilla instead of a flour tortilla. I tried to make it as healthy as possible and by my estimation, these are 5 Weight Watchers points for two tostadas. The trick is making the corn tortilla as crisp as possible. Baking them in the oven versus dredging them in oil and frying was a good way to make it a little bit healthier. The tostadas were a delightful brunch item for the weekend and one I will be remaking for a while. Spray corn tortillas on both sides with Pam Spray. Place in the oven and let cook for about 15 minutes, flipping tortillas half way. Bake until crispy. Heat refried beans either on the stovetop or in the microwave. I used about 1 Tbsp beans per tortilla. Place egg and egg white into a small bowl. Add milk and whisk until combined. Season with salt and pepper. Spray small sauté pan with Pam spray and heat over medium heat. Scramble eggs until done. Once tortillas are crispy, put them together by spreading heated beans on the tortillas. Top with eggs. Sprinkle cheese on top. Here you can either leave them as is or place back in the oven to melt. Personally I prefer it not melted. Top with salsa or tomatoes.